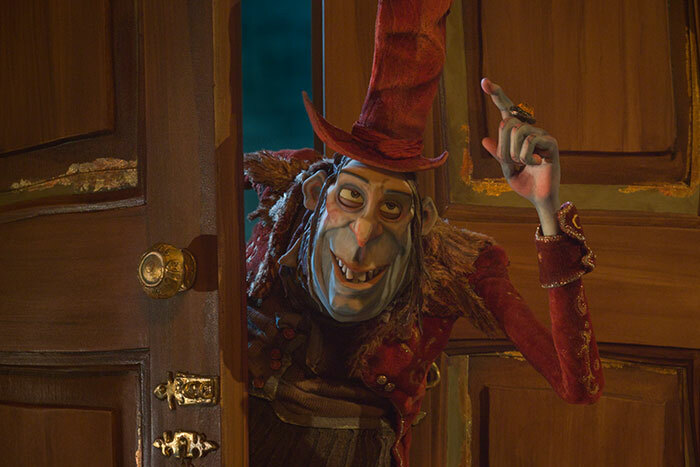 The Boxtrolls: Just Another Message Movie About Intolerance! 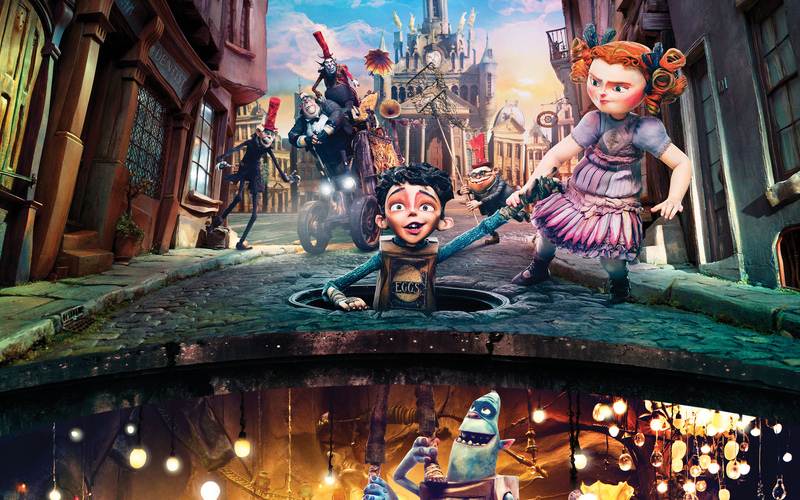 Laika, the company that produced the brilliant Coraline and fine ParaNorman, releases The Boxtrolls today. Sadly, while outdoing the first two in terms of technical wizardry, The Boxtrolls assembles a host of familiar elements with only one lead character and two minor ones really ever coming to life. The idea of an abandoned baby being raised by creatures other than humans has been around for a while (The Jungle Book, for instance).So has the idea of a class system (while not frequently discussed directly in polite company, England); an over-the-top villain who seeks respectability; non-human creatures that trundle away litter and cast-offs to make something new and useful from it (The Wombles); the benign neglect of inattentive parents (Laika’s own Coraline), and so forth. While the delightful designed Cheesebridge curls around a near mountain – richest at the top, poorest at the bottom, inside the mountain (which is to say, underground) live Boxtrolls – lovably grotesque creatures who have their own curious village from the refuse of the villagers. Boxtrolls wear discarded boxes and take their names from the labels on them – hence someone wearing a box that contained bottles of condiments might be called Ketchup, or Mustard. 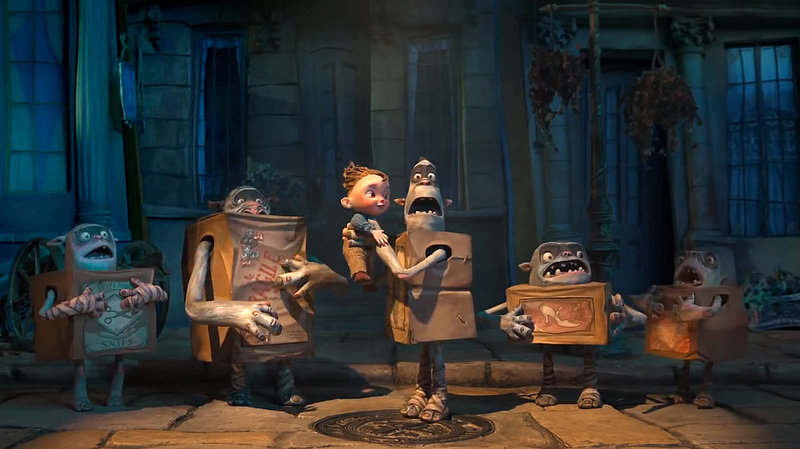 A decade or so ago, the Boxtrolls rescued an abandoned baby and raised him as their own. He was placed in a box labeled eggs. Aboveground, Class conscious, unscrupulous Archibald Snatcher (voiced by Ben Kingsley) has long spread the story that Boxtrolls are dangerous – they steal your stuff and eat your babies! He cites a baby that went missing about a decade before (Eggs? You bet!) as proof that Boxtrolls are evil and swears to eliminate them all. It’s up to Eggs (Isaac Hempstead Wright), with the very aggressive help Winnie (Elle Fanning), to stop him. Winnie is the daughter of the town’s mayor-equivalent – who has no time for her. She’s loud, obnoxious and sure that she’s always right – if only Daddy would wake up to that fact. Fanning makes her a complete delight. Since the Boxtrolls just pull themselves into their boxes and hide when danger approaches, it’s a simple matter for Snatcher to gather them up and cart them away. While he waxes at length, if not eloquently, about his plans, two of his three underlings – Mr. Tout and Mr. Pickles (voiced by Nick Frost and Richard Ayoade) discuss the nature of evil and whether they are, in fact, The Good Guys. Another element that comes into play is a figure from Eggs’ past – and yes, it’s probably the one you’re thinking of. Eventually, everything comes down to, ‘Why can’t we all just get along’ (to quote from one of Jack Nicholson’s least interesting roles…) only with a big nasty machine chasing Boxtrolls. Based on Here Be Monsters by Alan Snow, The Boxtrolls is a visual delight but yet another predictable message movie about intolerance. The technical end of the film goes beyond brilliant with its use of stop-motion animation reach new levels of quality – and using CG and hand drawn work to give the film a look and texture neither medium could achieve separately. I came out of The Boxtrolls amazed by the actual production, but wishing that Winnie and the philosophical minions could have had their own movies. I’d pay to watch that. Previous PostRecap: How to Get Away with MurderNext PostHector Mitty; Walter’s Search for Happiness!